Posh defender Rhys Bennett during the win over Gillingham. Back-in-favour Peterborough United centre-back Rhys Bennett is excited rather than nervous as the race for the League One play-offs reaches its climax. 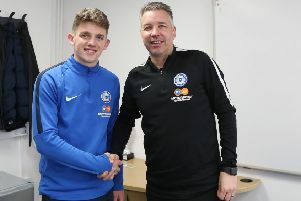 Bennett was outstanding last weekend as Posh beat Gillingham 2-0 at the ABAX stadium. He helped to quash the threat of free-scoring Gills striker Tom Eaves, a former youth teammate at Bolton Wanderers. Posh defender Ryan Tafazolli during the game against Gillingham. Bennett was a late replacement for Ben White and is expected to retain his place for the tough trip to play-off rivals Blackpool on Saturday (April 13). 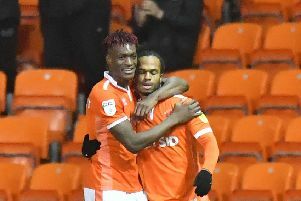 Blackpool will catch Posh up on points if they beat them at Bloomfield Road. “I know what a tough player Tom Eaves is from our time together at Bolton,” Bennett said. “He’s hard to play against, but myself and Ryan Tafazolli defended well. “I was just glad to be back in the side, helping the team to a clean sheet and three important points. “We have another tough game at Blackpool now. They are flying at home, the crowds are back and it should be a great game. We are looking forward to testing ourselves again. This is why we play football. We all want to be involved in great games at the end of a season. “We are very focused on controlling what we can control. If it turns out to be good enough for a play-off place then great, but it’s not worth worrying about what other teams are doing. “I’m grateful for the opportunity to be involved. Selection is not in my hands obviously and the lads played well without me in the previous game against Southend. Bennett was signed on a free transfer from Mamsfield by former manager Steve Evans last summer. He’s made 41 appearances this season. Ferguson said Bennett and Tafazolli were the team’s best players against Gillingham. He wants to see more of the same in the final six matches. “We’ve done well defensively in the last two games,” Ferguson stated. “And it’s key for us to keep clean sheets because if we do we will more than likely win given the attacking players at the club. “Ryan Tafazolli and Rhys Bennett were our best players against Gillingham. I would imagine the games coming up will be even harder for the back four, but they will take confidence into the matches.